Fans often ask me at readings which of my two dozen books is my favorite. The answer doesn’t pop up immediately, because I’ve published in so many genres: memoir, mystery, literary novel, short story collections, psychology, biography/literary criticism, historical fiction, Jane Austen mash-up, vampire, writer’s guide, essay collections. 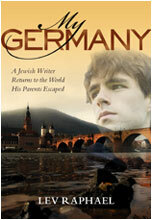 I’m the son of Holocaust survivors, and the book is a combination of history, family history, travelogue, mystery, and coming out story as I explore the role that Germany–real and imagined–played in my family while I was growing up and in my own life as an adult and an author. My Germany is also the book that garnered me the most speaking gigs of any book in my career, including two tours in Germany where I spoke in over a dozen different cities, and sometimes even read from it in German. It was a book I didn’t guess I would even want to write, and then a book that surprised me in many ways. P.S. 4/22/15: Five years after it was published, it’s still getting me invited to give talks and readings…..
Lev Raphael is the author of 25 books in genres from memoir to mystery and you can find them on Amazon.